This summer it has been my pleasure to join FreeAgent as a Data Engineering intern. Alongside the analytics and architecture teams, I have been working on a new exciting feature to complement the FreeAgent application. Programming mostly with Python, I have learned a great deal from my colleagues, and I wish to share the experience with you all here on the engineering blog. Since joining in early June, the intern project team have explored recent breakthroughs in machine learning, learned to use Docker to containerize our work, and taken advantage of Amazon Web Services. The feature itself remains under development, and until this is complete I’ll be keeping it a secret! Further details will be shared here at the earliest available opportunity. Like any new experience in life, I was filled with questions to ask on the first day. Entering the offices, I was keen to meet the team I’d be working with, keen to hear the details behind their plans for me this summer, and keen to learn and love the work performed by data engineers here at FreeAgent. I was given a warm welcome by our CEO, Ed, upon arrival, and I was quick to be introduced to the teams I’d be working with. It was an extremely exciting time for me, and I was keen to dive into the deep end and see where the summer project would lead me. Every morning at 0945 the analytics team and I would do stand-up. This is our opportunity to share plans for the day and to understand what everyone in the team is working on. If I have any queries about my work, this is the time to ask. We work under the agile development process, running weekly sprints for the intern project. During sprint planning we discuss what has been achieved in the past sprint, see what blocked us, how to resolve any outstanding issues, and proceed to plan for the sprint ahead. In addition to this, FreeAgent holds weekly engineering forums: An ideal opportunity to ask the wider team questions, discuss recent developments in the engineering world, and share views on recent tech talks engineers have attended. 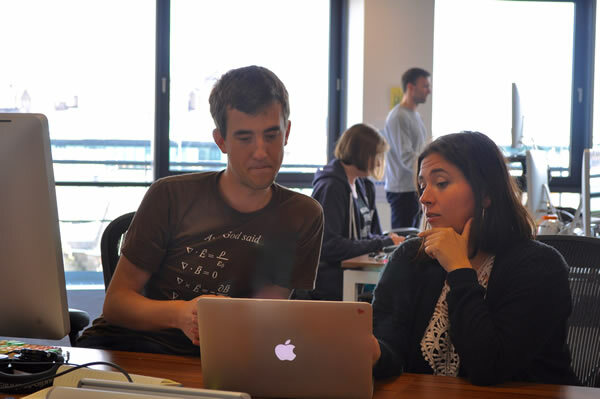 FreeAgent also offers sprint demos every fortnight for anyone to give a short presentation on their recent work. I had the pleasure of doing one for our project back in July, and received positive feedback from many of the engineers. To make the experience even better for the team, we hold various weekly lunch plans to keep ourselves filled for the day. My favourite being Burger Wednesdays – any excuse for a good burger! We have lunch outside our offices at Edinburgh Quay each Friday too, and often make spontaneous trips to many of the good food places around us. The offices themselves are less than a year old, extremely spacious and open-plan – making it easy to work with others around me. The surroundings are superb: We hold an extremely impressive view of Edinburgh Castle, with Arthur’s Seat visible in the distance. I remember it vividly from the day of my interview! A wide range of cold beverages are provided inside, along with an abundance of teas and coffees. FreeAgent has offered me a superb opportunity to build upon my existing Python programming skills, and I’m extremely grateful for it. Furthermore, I’ve found myself using SQL, and programming in Ruby for the first time. Combined with all the events that have been organised this summer, I have learned a great deal from the team, and I have made many friends I plan to keep in touch with in the years ahead. My time here is almost complete. I think now is as good a time as ever to say thank you, FreeAgent, I couldn’t have asked for better this summer!